I wanted to learn the best way to store my cheese. My current method is to simply place the cheese in a ziploc bag and refrigerate. I figured if I did some Googling, some reading and asked a few folks at the cheese shop then I would have it all figured out. I was partially right. This cheese storage thing can be pretty simple or it can be as complex as you care to make it. I have drawn the following conclusions (so far). Cheese should be stored at 40-45 F.
My ziploc bag method meets the temperature criteria. If I poke a few holes in the ziploc bag I satisfy the breathing criteria. I’m thinking that if I put a small damp paper towel in the ziploc bag I probably can satisfy the humidity criteria. That is my Cheese Storage on a budget solution. I found a more sophisticated solution called the Cheese Saver. The concept is simple and it makes sense to me. The good folks at Cheese Saver Incorporated have engineered a modern cheese storage system using some plastic ware within plastic ware and viola, your cheese storage problem is solved! Check out the The Cheese Saver website. The system is inexpensive and simple. Alternatively the idea could be easily duplicated with some Tupperware containers and a bit of modification. I found a high end cheese storage solution for the connoisseur with a big budget. It is called The Fromagair. 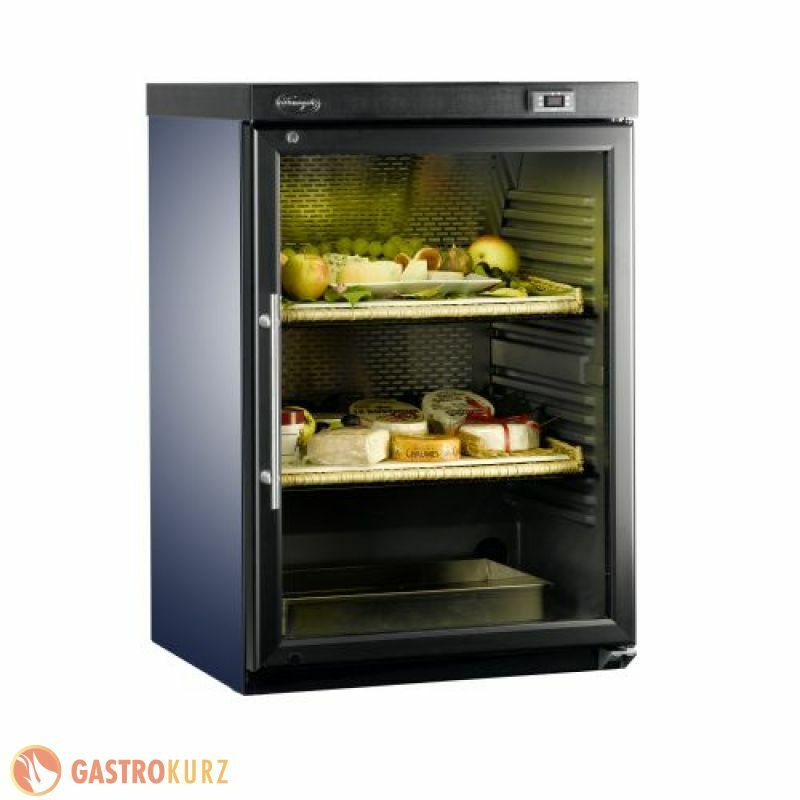 The Fromagair cheese climatization cabinet is not a refrigerator but a genuine climatically controlled cabinet that provides the ideal conditions for cheese storage. The Fromagair has two zones. One zone provides a temperature of 6 °C and a relative humidity of 90 % to slow down the cheese ripening process. The 2nd zone is set at 16 °C to keep the cheese at an ideal serving temperature. That is a pretty snazzy way to store cheese. Again the concept is simple. Store cheese at 6 °C with high humidity and warm to 16 C to serve. The short answer is “it depends”. You can expect almost any cheese to last at least several days if refrigerated. Once the cheese is cut, like the cheese at shops or grocery stores, it may last a few weeks weeks or a month if properly stored. Cheese that is uncut, like a wheel of aged cheese, can last a long time, maybe years. Hard cheese lasts longer than soft cheese. It is a good idea to label your cheese with the type and date purchased. The ziploc method is ideal for this. Just write on the bag. If cheese has been left out and begins to break down, you can clean off the outer surface to remove oils. Use a knife to scrape it off. Once left out, it is recommended to store the cheese in a container instead of wrapping. If you freeze cheese, the flavor will be altered. It is recommended only if using cheese for cooking. Store your cheeses in the lower shelf of your refrigerator, far from foods with strong odours, to avoid absorption of unwanted tastes and smells. Some people recommend wrapping the cheese in plastic wrap to provide a tight seal to protect the cheese from moisture, odor and possible molding in the fridge. But this method is contradictory to the “let it breath” philosophy leaving me a bit perplexed. If you are the engineering type you may be inclined to get a bit more exacting with your cheese storage plan. For the perfectionists I came across specific suggestions based on cheese type. I call these the Cheese Storage Formulas. Rindless cheese like Marscapone, Mozzarella and Ricotta should be stored at 35F to 39F. If the cheese is purchased in a plastic container, continue to cover it tightly in storage. Chevre should first be wrapped in parchment paper or foil, and then stored in a tightly sealed plastic container. Feta keeps best when stored in a salt brine bath in a tightly sealed plastic container. If you find mold on a fresh, rindless cheese, discard the entire product. Semi-soft cheeses such as Havarti, Cheddar, Colby, Swiss, and Monterey Jack should be stored at 40F to 45F. Cut cheese should be wrapped in parchment or waxed paper first and then again in plastic wrap, or simply stored wrapped only in plastic wrap to help retain moisture. The natural rind cheeses include semi-hard and hard grating cheeses such as Parmesan, Romano and Asiago. Store these cheeses at 40F to 45F degrees tightly wrapped in plastic wrap to prevent moisture loss. A washed rind cheese is bathed regularly by hand during aging with a bacterial solution to promote ripening and flavor development. Examples include Gruyère, Limburger, Raclette and Italian-style Fontina. Store washed rind cheese at 40F to 50F at an elevated humidity of 65%. If the cheese is cut, wrap it in waxed or parchment paper and place it in a plastic container pierced with several holes to allow air circulation. If the cheese appears to be drying out, place a clean, slightly damp towel (paper towel is fine) in the bottom of the container to elevate the humidity. If the cheese begins to smell ammoniated, remove it from the container and let it sit uncovered in the refrigerator or on a clean counter. Once the odor is no longer present, rewrap the cheese in clean paper and refrigerate. If the odor persists after 2 to 3 hours, discard the cheese. Bloomy rind cheeses include Camembert, Brie and some Chevres. Store bloomy rind cheese at 40F to 45F with elevated humidity. After bloomy rind cheese is cut, place a thin piece of parchment paper over the exposed area and use the original wrapping to cover the cheese. Or, store the unwrapped cheese in a sealed plastic container pierced with a few holes for air circulation. Place a clean, slightly damp towel in the bottom of the container to elevate the humidity. Store blue cheese at 40F to 45F with elevated humidity. The cheese should be wrapped in aluminum foil, preferably the original foil you receive the cheese in. Finding mold on a blue-veined cheese is usually a good thing. However, if the mold appears black and slimy, discard the entire piece. I don’t think you can go too wrong storing cheese. It is a fairly low maintenance food. The cooler the temperature that it is kept the longer it will last, short of freezing. I’ve had cheese sit out for many hours while entertaining and it has lasted perfectly fine. Ideally it is at room temperature for optimal flavor any way. Why store cheese anyway? If it’s good … eat it!